Funko Star Wars Last Jedi Mystery Minis gives Episode VIII characters a miniature makeover. The main options for The Last Jedi are joined by exclusive minis found only at select retailers. 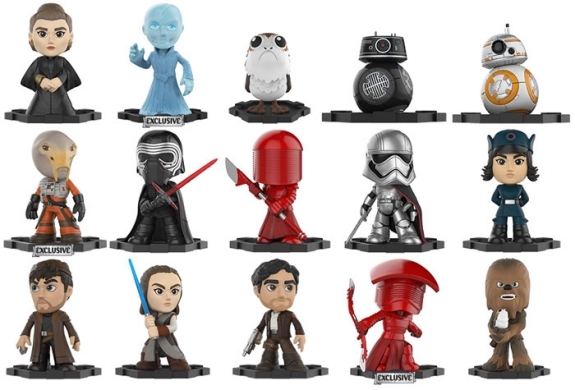 Like Funko Classic Star Wars Minis, The Last Jedi set features detailed figures on a rounded disc. Another unique aspect to the Star Wars-themed minis is that fans have the ability to connect the discs together, making one large display. Resembling their Pop! The Last Jedi figures, fans will easily recognize Rey, Finn, Princess Leia and Chewbacca in the fun-size set. Additionally, Captain Phasma, nearly identical to her Pop! The Force Awakens edition, is included in the main format along with BB-8 and a helmeted Kylo Ren. Although all the figures can be located based on the formats noted below, you might need to use The Force to uncover your favorite subject. 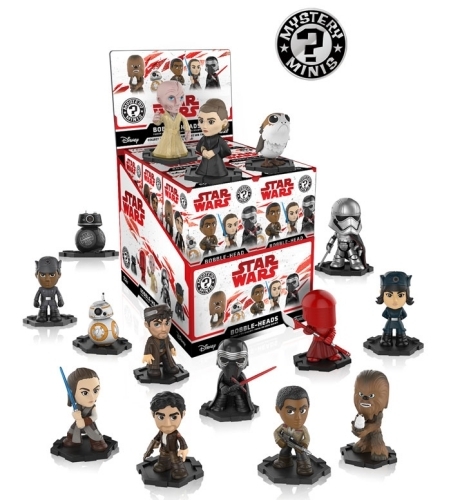 This is because Funko Star Wars Last Jedi Mystery Minis has a blind-box format, which means each box looks the same in order to maintain the element of surprise. 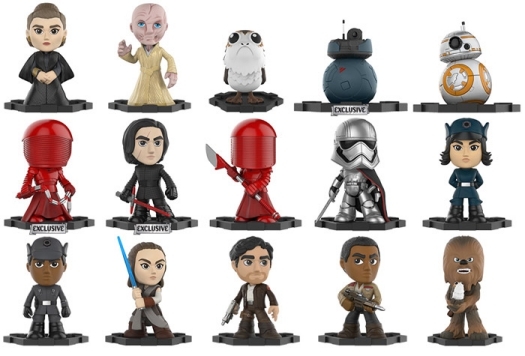 Growing the totals, there are exclusive figures at three different retailers: GameStop has the First Order Executioner, Porg with open wings, and Rey wearing a cloak; Walgreens is the place to find C'ai Threnalli, Praetorian Guard in an action pose, and holographic Supreme Leader Snoke; and Walmart offers Kylo Ren unmasked, Praetorian Guard with a whip, and Resistance BB Unit. 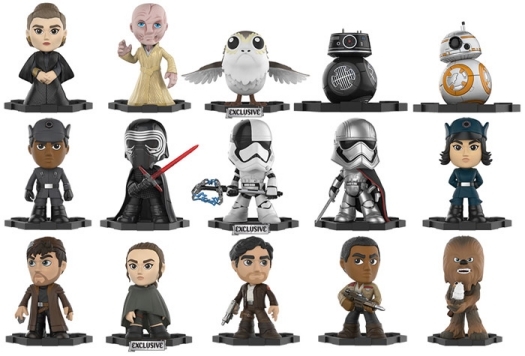 Including these exclusives, there are at least two dozen Funko Star Wars Last Jedi figures to chase. With 12 boxes per case, a full set will require more than one case and collectors will also need to visit each retail outlet for the exclusive figures. Box odds for the Funko Star Wars Last Jedi Mystery Minis figures are noted below. Take a look at many of the other Funko Star Wars options using our related guides.